Building on a decade of experience in university and college masteplanning in the UK and Ireland, BDP has won the commission to design seven new universities as part of a major programme of educational development by the ODAC (Organisation for the Development of Administrative Centres) an agency of the Libyan Government. Two of the universities are located within coastal towns to the west of Tripoli and one in the mountainous area which lies 50 km to the south. The other four complexes are located within the Sahara Desert 1,000 km south of Tripoli. These will serve neighbouring communities in Libya as well as the wider regions of sub-Saharan Africa. The design ideas are shaped around the differing climatic factors of the localities, determining strong environmental and social groupings to the buildings and public spaces. Created as ‘variations on a theme’ the designs build on the academic plans set within the overall programme, to create a commonality and efficiency of built and special elements while bringing individual identity through response to local settings, microclimate and culture. BDP has been commissioned on an interdisciplinary basis including masterplanning, architecture, space planning, structural and environmental engineering, sustainability, acoustics, lighting and landscape design. Infrastructure engineering is by Scott Wilson and fire engineering by Tenos. BDP is presently also masterplanner for the universities of York, Sunderland, Birmingham City, Worcester, Anglia Ruskin, East London, Glasgow, Newport and Limerick. BDP is also masterplanning new further education colleges in Norwich, Lambeth, Brighton, Motherwell and the National College for Art, Science and Technology in Malta. 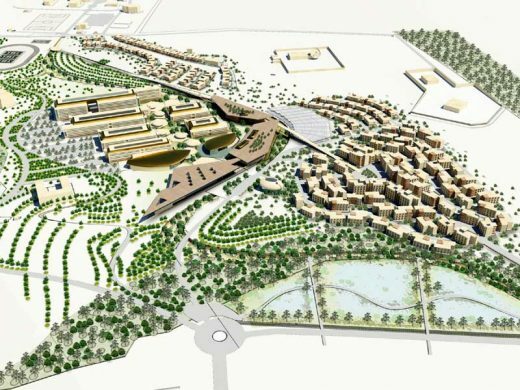 TOTAL 28,400; 14 different faculty types and related common facilities, 15,000 student residential units and 600 staff units (spread across the various sites). IT, Science, Dentistry, Pharmacy, Law, Linguistics, Medicine, Medical Technology, Accountancy & Economics, Natural Resources, Nursing, Literature, Engineering, Business Management.